For millennia, tales of lost civilizations have captivated humanity, and foremost among them is the legend of Atlantis. 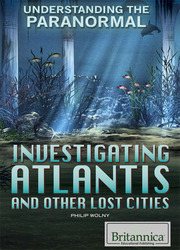 In this guide to Atlantis and other lost lands, readers will learn to sort through fact and fiction, learning about the historical origins of lost-city legends, the lessons they teach us, archaeological digs for the truth, and—perhaps closest to home—their place in popular culture. The main focus is on the tale of Atlantis, with sidebars that highlight similarly “lost” mythical societies. For fans of the paranormal or seekers of the truth, this is the definitive book to read.